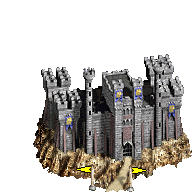 Some time ago, J.M.Sower made Castle graphic depending on terrain. 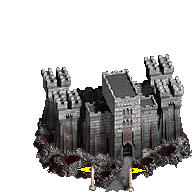 Castle always is set with standard grass base and defs aren’t placed in map editor. Thanks Macron1, it makes sense. I must check that. But tell me one thing: why village is mentioned four times? Village mentioned 4 times because for grass there are 4 village looks (buildings in progress). If you have only 1 village look for each terrain, you must use only one filter for each terrain. In hero format, can a hero be set up to carry a artifact? Yes, but try not to set up artifact in first slot. There’s possibility then to create ‘ghost’ hero. 2 creatures casts Frost Ring damage still 60. Unit must have CREATURE_SPELL_POWER bonus to make its count affect spell power. hero format,hero carry Armageddon’s Blade code? Hero cannot dig (error code 1)! Got false in applying 11DigWithHero… that request must have been fishy! System message: Server encountered a problem: Hero cannot dig (error code 1)! o… that request must have been fishy! Yes, sometimes when hero try to dig for Grail, I got the same message. This hero is unable to dig in any place. But when you buy another hero, he can dig without problem. It’s rare bug. im trying to make a mod of my own. first of all, i want to start from small to big, step by step. The first teeny tiny step would be to add different types of ‘buffs’ to all creatures so that it reflects reality: humanoid, living, undead,mechanical, golem, elemental, beast, demon. And i started up with the undeads becasue i saw on the wiki page that you guys have implemented the “UNDEAD” buff. I have tried to modify the skeleton with this buff and the game refused to start. I was sure i was doing something wrong since i have minimal knowledge about c++ and modding in general and then i tried to add a simple cast (sorrow) after attack effect and everything went well until i entered the battle. The game crashed. 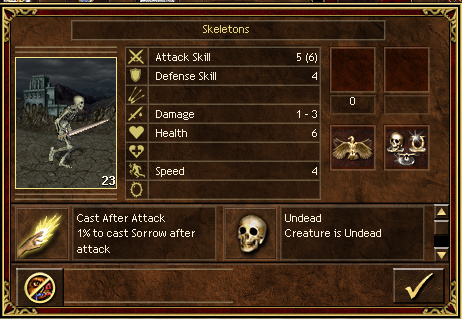 I want to mention that both versions (the one which added ‘undead’ to skeletons and this one) have been recognized by the Launcher and they make it in the mods list. And the game was able to enter the battle before (and with my mod disabled). Am i doing anything wrong? what can i do as a starter to understand modding and vcmi better? (i read all wiki, i didnt find a list of values though, like the list of creature numbers or spell numbers). I really want to do things and i really need help. thank you in advance. It’s ok with this simple code, but please upload your mod - sometimes files structure inside is important and can generate crashes! Kindly see the below link. As I thought, you have wrong files structure. I guess you want to make every creature type selectable/de-selectable in launcher so you want to make few submods. Then you must create Mods folder in your mod and inside it put all your sub-mods. Creating Mods folder fixes skeletons. It means Sorrow is casted with 10% probability, spell level is 1 - base magic school, and it can be casted after meelle attack (2). that looks neat! thx for your help. the game still crashes when entering a battleground so i disabled all mods. Apparently, this happens anyway. It says that it cannot find POTRAITSMALL/CANIMATION. All this on a newly installed VCMI over h3 complete. Is this because of the lack of hero portrait (linked bugs about portraits, be it hero or creature)? Is 0.99 the latest one? No, new vcmi versions can be found here: https://builds.vcmi.download/branch/develop/Windows/ (for windows). Install it carefully to your Heroes 3 folder. Sometimes ‘/’ at the end of installation filepath leads to installation one folder deeper and not override files - you must check it. If you did it, reinstall vcmi (with daily build), then install vcmi essential files and play! Is growing command for artifacts works for heroes?